Chicago | Reuters — U.S. soybean futures climbed to two-week highs on Tuesday as the Trump administration said it would provide up to US$12 billion in aid to shield U.S. farmers from economic pain stemming from trade disputes. 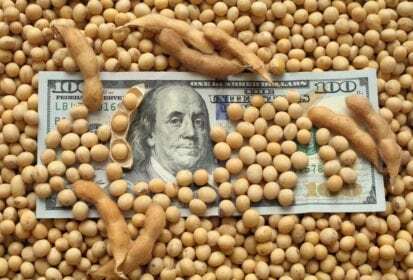 The program will include direct payments for farmers, and those who grow soybeans are expected to be the biggest beneficiaries, according to the U.S. Department of Agriculture. The payments will allow farmers to keep crops in storage, as opposed to selling them to merchants and processors, said Dan Cekander, a grain market analyst and president of DC Analysis. This can provide underlying support for prices, he said. China has targeted U.S. agricultural exports with tariffs in retaliation to those imposed by U.S. President Donald Trump, because voters in farm states helped propel him into office in the 2016 election. The aid package is the biggest direct compensation for farmers over such retaliatory tariffs, said Scott Irwin, agricultural economist for the University of Illinois. “Twelve billion dollars, the vast majority of it sent to farmers mainly in the Midwest in the form of direct payments, is a shock-and-awe response to the hit that farmers have taken in the trade war,” he said (all figures US$). The most actively traded soybean contract rose 1.2 per cent to $8.73-1/4 a bushel at the Chicago Board of Trade and reached its highest price since July 10. USDA said the aid package would be a short-term solution to trade fights. It will also include trade promotion and food purchases. The program signals that trade tensions will drag on, which may weigh on crop prices over the longer term, said Brian Hoops, president of broker Midwest Market Solutions in Missouri. “If they’re willing to do that, there’s no quick resolution coming,” Hoops said. Beijing imposed a duty on imports of U.S. soybeans on July 6, after threatening to do so for weeks. Chinese buyers shifted purchases to Brazil from the U.S. because of the tensions. This pressured U.S. soy prices and increased sales to other countries, such as Pakistan. Demand from importers and domestic processors helped support soy prices on Tuesday, said Arlan Suderman, chief commodities economist for brokerage INTL FCStone. “Right now all non-China business for soybeans is coming to the United States,” he said. In other CBOT markets, corn futures slumped after USDA reported better-than-expected U.S. crop conditions on Monday. Corn slid 1.4 per cent to $3.66 a bushel, and wheat dipped 0.7 per cent to $5.10-1/4 a bushel. — Tom Polansek reports on agriculture and commodities for Reuters from Chicago; additional reporting by Michael Hirtzer and Karl Plume in Chicago, Michael Hogan in Hamburg and Naveen Thukral in Singapore.